Note: This post is purely intended to demonstrate the use of MFCMAPI to delete calendar delegate rules. There are several other steps you may want to go through before you actually go ahead and follow steps in this post. Outlook, LDAP and MAPI offer a great feature of delegation of mailboxes to a particular user within the organization. It works almost the same way in all version of Exchange Server 200x family. I am not pretty sure about Exchange 2010 yet because never had a chance to look at it so closely. The e-mail address could not be found. Perhaps the recipient moved to a different e-mail organization, or there was a mistake in the address. Check the address and try again. This type of NDR starts generating after you delete some user account from your organization and this user account was also a part of some DL and at the same time was delegated permissions on some other user’s mailbox in the same DL. Another case would be when you already know the delegated mailbox name however you are not able to fix the issue. Script shows all the delegate and forwarding rules in mailboxes. I will strongly recommend reading instructions at above link before you run it. 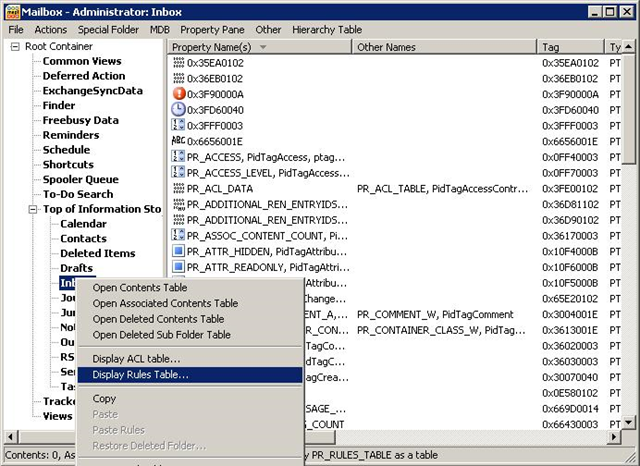 Once you get the name of desired mailbox you can certainly remove the rule either by logging on to the mailbox or by using MFCMAPI or mdbview32.exe. An alternate location to download it would be here. B. 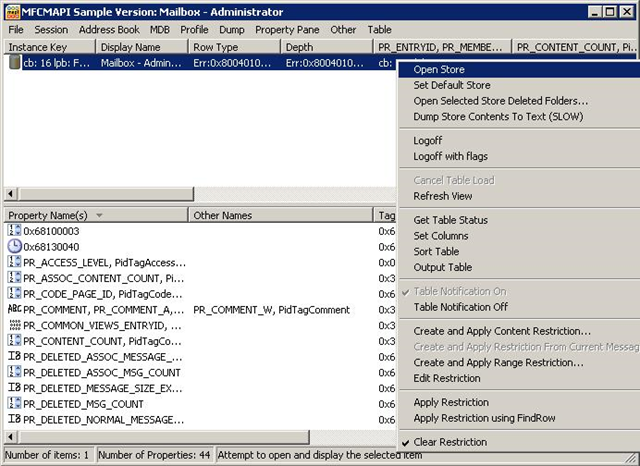 Right click on the mailbox you are logged on as and select Open Store from the context menu. C. The next screen comes up which explore all visible and invisible folders in your mailbox. E. Another windows opens up and shows you the rules configured in the mailbox. Please note that only server side rules are displayed here. F. This window may display several other rules as well. You have to find and select the rule which is provided by Schedule+ EMS Interface. G. Right click on the rule and select to delete. F. Any other rule can also be deleted using the similar method. This entry was posted on 30/04/2009 at 8:40 AM	and is filed under Exchange Server 2003, Exchange Server 2007, MBX. You can follow any responses to this entry through the RSS 2.0 feed. Both comments and pings are currently closed. Thanks for the post which is very useful for deleting the hidden Delegate rules. Now after we delete these rules, i am trying to add old existing users in the delegate list. Seems that newly added rules are not working on mailbox. 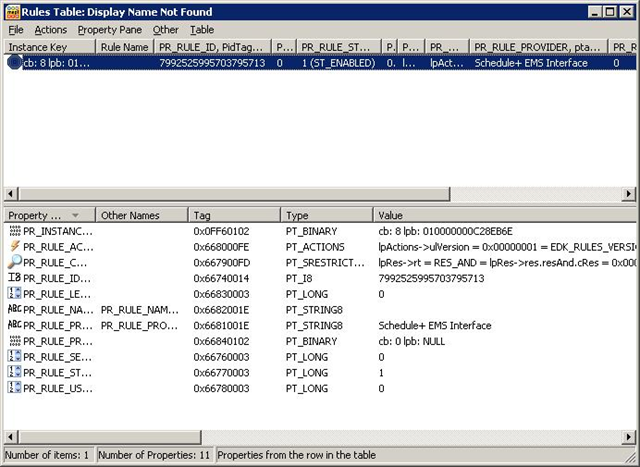 The rule that you see PR_RULE_PROVIDER as “Schedule+ EMS Interface” is created if that mailbox has a delegate assigned. This is a hidden rule which gets created automatically when adding delegate.